Donna Hay is in my Kitchen! 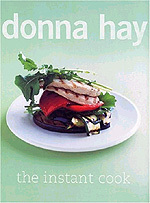 Donna Hay, Australian cookbook author and magazine publisher, rummaged through my fridge and pantry and then told me how to cook a delicious recipe. Her new cookbook is called The Instant Cook, published by Harper Collins. You can win one of two copies of the book by going to my Blog and telling me about your favourite fast meal to cook. Join me on a visit to North America's oldest and largest Chinatowns. I was one of the judges at a USA-Canada cookoff during an International Culinary Tourism Association convention in San Francisco. The Canadian team prevailed, even though I scored the Americans higher on my ballot! It was their dessert that made the difference for me, as Canada was ahead on my scorecard before the final course.